Hi there! This week is release week for Neat & Tangled and I’m excited to continue to share my projects using new goodies. You can see Day 1 here, Day 2 here and Day 3 is here. I love the Punch Today in the Face block and I need to figure out a way to use in on a card or a little inspiration tag. Its such a fun motivational sentiment! 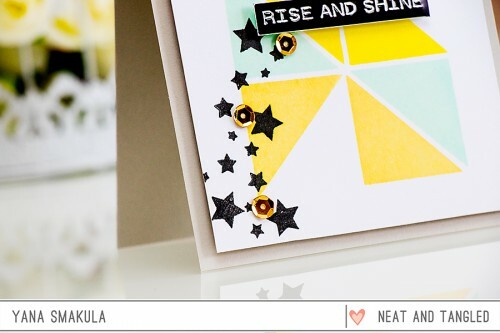 Today however, I used the little triangle and the cute little stars to create my card. 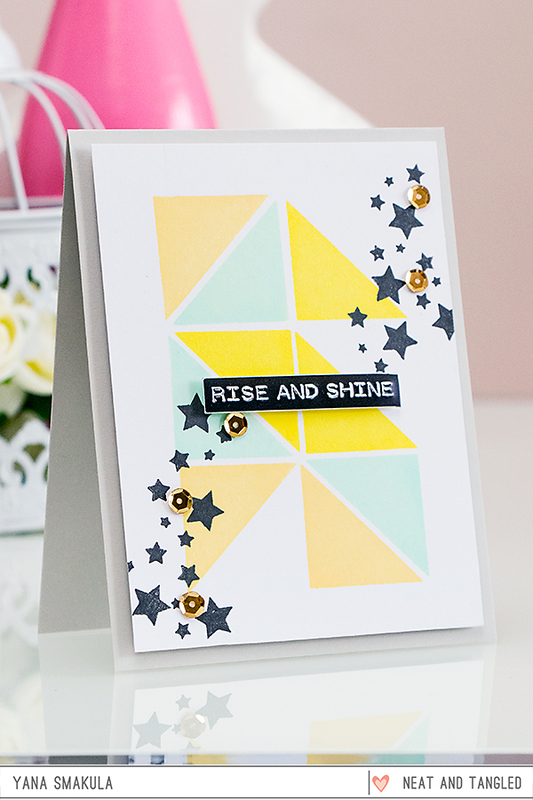 I started by stamping a pattern onto white panel using the triangle stamp using 3 colors of ink – Lemon Yellow, Mint and Butter Bar (all from Hero Arts). 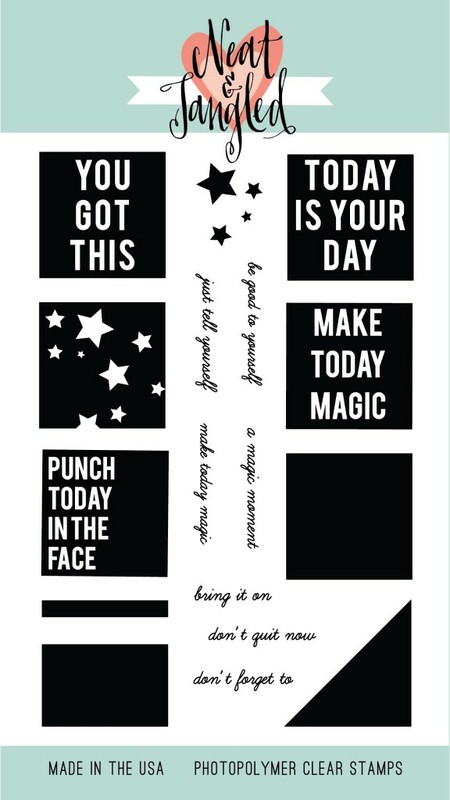 Next I added several start in black and adhered a black and white Rise & Shine sentiment sticker from Cosmo Cricket, which sadly is already sold out everywhere. I adhered my stamped white panel onto a light grey card base and embellished my card using gold sequins from Neat & Tangled. As always, there’s a giveaway on the Neat & Tangled blog, Danielle is giving away Planner Blocks Stamp Set. Be sure to stop by and leave a comment on Neat & Tangled blog for your chance to win! oh my gosh, this is amazing Yana, I absolutely LOVE how you did this card! The stars scattered across to each corner add so much movement too, its perfect!!! Such a great card! I love how you used the triangles, wonderful colors and love the stars! A very nice card Yana. This is such a versatile set. I love that you can use it in your daily planner yet make such lovely cards. A great set, for sure. I totally agree with you, Teresa! very versatile, thank you! Love this graphic and modern look, beautiful card!! What a great card! I love the geometric details! thank you, Celeste! I too love using geometric elements on cards!